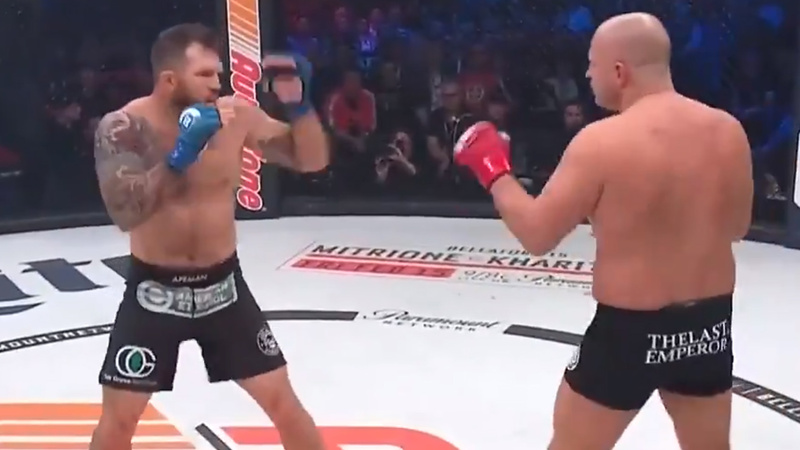 Ryan Bader Put Fedor Emelianenko To Sleep After Only 35 Seconds! Bellator 214 is happening tonight (Saturday, January 26, 2019) from inside The Forum in Inglewood, California. The main event of the evening brings the Heavyweight Grand prix Final between the former Pride FC and WAMMA king Fedor Emelianenko and Bellator MMA 205-pound champion Ryan Bader. Fedor has red gloves, while Bader wears the blue ones. The referee is Mike Beltran. Let’s go! Ryan Bader bounces on his feet. Fedor looks very cautious at the beginning of the match. Wow, Bader drops Fedor with a long left hook, what a technique, straight to the chin! Emelianenko put his hands down he goes to the ground, Ryan delivers two more short strikes and Beltran steps in, the fight is over!!! Fedor Emelianenko drops to 38-6 MMA, 1 NC, 2-2 BMMA, Ryan Bader improves his score to 27-5 MMA, 5-0 BMMA.